Vodafone Fiji has handed a $25,000 cheque for the Vodafone Primary Schools Football Under 12 and 14 championship to be held at Prince Charles Park, Nadi, on August 22-24. Handing over the cheque was Vodafone Fiji Sponsorship manager Adriu Vakarau, who said Vodafone believes in the development of football in the country. “Through our sponsorship we strengthen our bond with the sport, the true reflection of our passion and commitment for the sport can be seen in our bid to firm-up the foundation of football by support to the grass root level of football in the country,” Vakarau said. “We are proud to be the name behind our football teams in supporting them to achieve victory,” he said. “The Primary Schools Football Championship has grown in stature since its inception in 1975 with many district schools entering the competition. “This year we will witness a total of 28 teams taking part in the boys Under 12 and 14 divisions and I am delighted to say that there will be four girls team in the championship and i salute the committee for making this possible,” he said. Vodafone Fiji has increased the sponsorship by $1000 this year and apart from the $25,000 sponsorship Fiji Football is injecting an extra $1200 for women’s participation in the U14 and 12 grades. 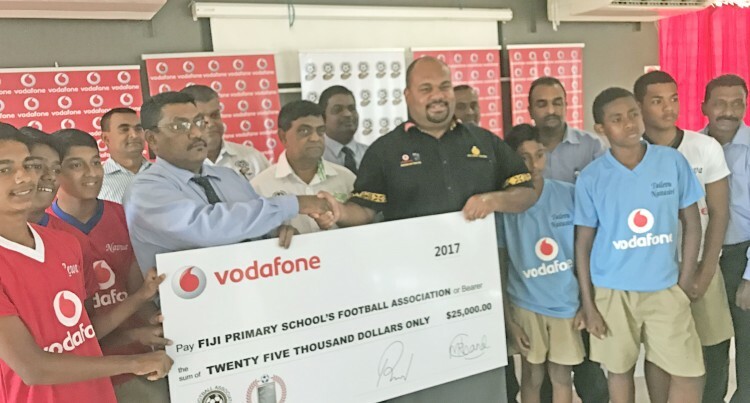 Fiji Primary Schools Football Association president Ami Chand acknowledged Vodafone for the kind gesture. “We thank Vodafone for their commitment in the development of soccer and also Fiji Football for being very supportive. “We are delighted with the increase sponsorship of $25,000 I assure you all that we will utilise this funding well for the students when they enter the field,” Chand said. Pool B: Ba, Rewa, Navosa, Seaqaqa.